In the spring of 2008 I was loaned a pair of Altec Lansing Super Duplex 604E for testing and research about possible crossover improvements. Unfortunately, one of the drivers had sustained damage to a compression driver binding post during shipment, and as I removed its rear cap for an inspection of the damage I discovered that the 604E had been equipped by Altec with compression driver rear loading caps. I remember the first time I removed the rear cover of an Altec Lansing small format compression driver (1” dia. throat) and saw a black plastic factory loading cap mounted over that delicate and fragile aluminum HF diaphragm. It was part of an 802-D that had come with my recently purchased A7-500s. Altec, I had been told, recommended loading caps on its small format compression drivers which were crossed over at 500Hz or 800Hz to prevent diaphragm over-excursion at high output levels. I had also been told by another Altec home user that removing the cap would result in a sweeter and more natural sounding high frequency reproduction. The latter sounded very inviting to me, and, as I didn’t expect to run my A7s anywhere near theatre output levels, I removed the loading caps, re-secured the diaphragms with slightly shorter mounting screws and placed a thin layer of acoustically absorbent material inside the rear covers. It was good advice. The HF musical presentation was much more natural and relaxed sounding to my ears, and certain sounds, like brushes on cymbols, sounded fantastically accurate and real. That was over 20 years ago and I never used loading caps in home settings after that day. So here now was an opportunity to test the 604E, both with and without its compression driver loading cap, and see what some objective data might say about the wisdom of throwing out the compression driver rear loading cap. The first screen shot above shows MLS Frequency Response of the 604E compression driver with (red trace) and without (blue trace) a loading cap. The measurement was made on-axis and the compression driver was driven directly without a crossover network. Information below 200Hz is not accurate due to the short time period of the MLS test signal utilized. It would appear that there is very little difference between the two configurations from 1000Hz and up, which is where one listens to a 604E compression driver. So far, so good. The second screen shot above shows impedance data for the 604E compression driver with (red trace) and without (blue trace) a loading cap. The measurement was made with CLIO in Internal Mode, which is similar to a Constant Current type of impedance measurement. Data is accurate from 10Hz to 20kHz. Here we see significant differences between the two, particularly in the peaks and overall smoothness of the two curves above 1kHz. The 604E without a loading cap appears to be my preferred choice here. The third screen shot above shows phase data of the 604E compression driver with (red trace) and without (blue trace) a loading cap. Phase information is recorded along with impedance measurement data. Here we see the wisdom of Altec Lansing using the loading cap for 500Hz and 800Hz applications, as its phase response below 1000Hz is quite benign. On the other hand, the unloaded driver’s phase dips to the -15 to -20 degree range at 500Hz and 875Hz. Still, once we get above 1000Hz the unloaded driver appears to be a good choice for a duplex like the 604E. The last screen shot above shows ETC (energy-time curve) data of the 604E compression driver with (red trace) and without (black trace) a loading cap. Here we see the drivers have similar signatures, with the rear-loaded one producing a more controlled and linear overall decay following excitation by the MLS impulse. I believe the data above shows the wisdom of using a rear loading cap with any Altec small format compression driver that is crossed over below 1.5kHz and intended to be operated at or near its rated output level. I don’t believe the cap’s use is required for the 604E user in a home HiFi environment, however, as CALSOD modelling shows that the combined output of the driver and filter combination rolls off at approximately 15dB/octave below crossover. Eventually Altec switched to a third order slope for the factory high pass filters supplied with the 604-8G/H/K, and eliminated the rear loading caps of the drivers. 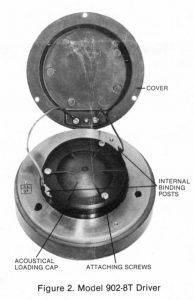 Rear loading caps were still installed on loose drivers (802/808/902/908/909) purchased from Altec, as the eventual crossover point was likely to be below 1.5kHz. The cap could always be removed by the end user if desired.